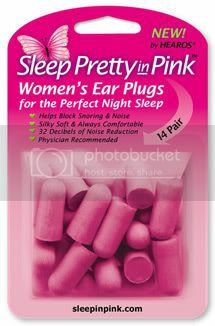 So, what is it about these earplugs that makes them "designed just for women"? Duh! They're pink, of course! But wait! There's more! What do the earplugs marketed to men look like, you ask? I'm pretty sure that every single woman I know would pick the pirate screw earplugs over the pink ones, just because the idea of putting screws in your ears is so badass. This sort of branding is important, and I'm glad you're pointing it out. I still get weird comments from people when I buy Luna bars. It's totally hilarious how certain products are considered men's or women's only. I had a guy friend once who would only buy the "men's" version of Chapstick. It had the exact same fruity smell as regular Chapstick, but the difference was that it was gray instead of reddish pink, and it came in a gray tube. By the way, the difference in the two products is especially hilarious if you click on the links and watch the respective video and flash animation for each one. So funny. geeez!! i didn't know they even marketed ear plugs like that; all the ones i've seen are a generic school-bus yellow. 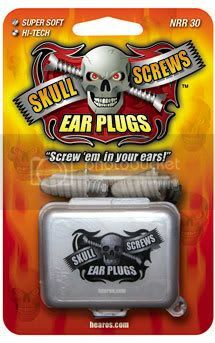 i'm for the pirate screw earplugs. OMG! That is absolutely hilarious. It really really looks like a joke. If anything, this post makes me feel even more confident in my pre-summer-music-festivals purchase of a container of gender-neutral, flesh-colored earplugs. Jender: I know! I almost wouldn't believe it myself if I hadn't actually seen them in the store. Winona: Yeah, but aren't you disappointed that you could have had the "pretty" ones engineered just for your lady-ears?